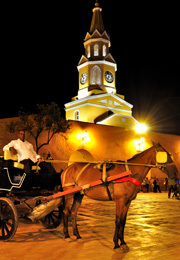 Cartagena de Indias is a city of legends, which over time became a World Heritage Site. Whoever comes here, gets caught by an aura of happiness and the feeling surfaces. A carriage ride through the streets of Cartgena is a statement of love, is to enter the fantastic world of history, es being seduced by the Caribbean Sea breeze and above all, is living an unforgettable experience. Paseo en coche (Carriage Ride) is a company that guarantees compliance, security and has developed expertise in conducting national and international events: Weddings, Conventions, Tours of the historic city.